Dominion Energy Virginia and Denmark-based Ørsted have taken significant steps forward in the development of Virginia’s first offshore wind facility. Dominion Energy has filed with Virginia’s State Corporation Commission for approval to build the two 6 MW turbines and grid infrastructure needed to connect the facility to the coast. The project continues what was previously called the Virginia Offshore Wind Technology Assessment Project, VOWTAP. Dominion Energy began work on the project in 2011 as part of a Department of Energy grant to develop and test new wind technologies that could lower costs and withstand hurricanes. Key achievements were made to advance the project during that time, including the Bureau of Ocean Energy Management’s (BOEM) approval of the Research Activities Plan; environmental studies, including avian and bat surveys; and assessments of ocean currents, archaeological conditions, and whale migration patterns. The WTGs will be located about 27 miles off the coast of Virginia Beach in 2135 acres of federal waters leased by the Virginia Department of Mines, Minerals and Energy. The two turbines will sit in about 80 feet of water and rise over 550 feet above the ocean’s surface – but will not be visible from the Virginia Beach shoreline. The facility is expected to begin generating energy by December 2020. While officially a demonstration project, it would be the first constructed in federal waters through the Bureau of Ocean Energy Management’s (BOEM) approval process. It will be the country’s second commercial- scale offshore installation, following that off the coast of Block Island, which has been operational since 2016. The project will provide critical permitting, construction and operational experience, and could pave the way for 2000 MW more generation in the adjacent 112 000 acre wind energy lease area. Dominion Energy currently leases the acreage that would be needed for this facility from BOEM. 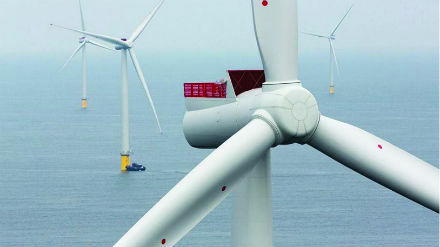 Block Island Wind Farm, the first, and at present only, commercial offshore wind farm in the USA is located 3.8 miles from Block Island, Rhode Island. The 30 MW project was developed by Deepwater Wind, operations were launched in December 2016. The array has shut down due to malfunctions in the system several times, but it still maintains long-term operation. Energy Management Inc’s 468 MW Cape Wind, off the coast of Massachusetts was declared officially dead in December last year through cancellation of take off contracts. Delaware Offshore Wind Farm. Bluewater Wind, 200 MW, abandoned in 2011. University of Maine offshore wind farm. Maine Aqua Ventus. Floating deepwater turbines. Halted in June 2018 when state regulators voted to reopen a previously negotiated power contract. Fisherman’s Energy Atlantic City Windfarm, New Jersey, owner EDF RE, had been postponed in July 2017. The developer plans to submit a new application this autumn to build in federal waters up to 1100 MW capacity. Virginia Offshore Wind Technology Advancement Project (VOWTAP). 12 MW. Dominion had been awarded a $4 million advanced technology offshore demonstration grant by the US DoE in 2012 and another $47 million of DOE funding in May 2014. But in May 2016, VOWTAP was dropped from the DOE programme after failing to meet funding milestones, putting the project on indefinite hold, together with Dominion’s plans to develop up to 2 GW of the Virginia coast. (See update, below). Bay State Wind. Massachusetts. A Rhode Island competitive tender. Owner Orsted. A proposal application on 12 September 2018 for offshore wind turbines generating at least 400 MW and possibly up to 800 MW. Selection of bidders in May 2019. Coastal Virginia Offshore Wind Project, Virginia. A small project consisting of two wind turbines off the coast of Virginia Beach generating a combined total of 12 MW, to be built by Orsted for Dominion Energy. The project is the subject of this article. Potential for expansion of up to 2000MW. Deepwater Wind South Fork, New York state. 15 turbines, to be constructed from 2019, with 90 MW of power supplying Long Island. First operations slated for 2022. Empire Wind, New York. Early planning/concept (as of August 2018) for offshore wind turbines generating at least 1000 MW and possibly up to 1800 MW[, in operation by 2025. Revolution Wind, Rhode Island. 50 offshore turbines, to be constructed from 2020, with 400 MW of power supplying Rhode Island. First operations in 2023. Skipjack Wind Farm, Maryland. 15 offshore turbines, to be constructed from 2021, with 120 MW of power supplying 35 000 homes on Maryland’s Eastern Shore. First operations in 2022. US Wind, Maryland. A plan for offshore wind turbines generating at least 250 MW and possibly up to 600 MW of power supplying homes in Maryland. Planning approval expected in 2019. US Wind, New Jersey. Early planning/concept (as of August 2018) for offshore wind turbines in the New York Bight generating at least 1500 MW and possibly up to 2230 MW of power supplying homes in New Jersey. Vineyard Wind, Massachusetts. 100 offshore turbines, to be constructed from 2019, with 800 MW of power supplying up to 450 000 homes. First operations in 2021.